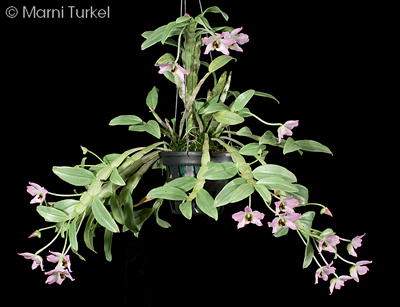 Dendrobium trantuanii outcross #1487 ('9714' x 0379') (approximately 25 seedlings per flask). The Species: This species is a recent discovery from northwestern Vietnam that was first described in 2003. It is also sometimes called Dend. tuananhii. 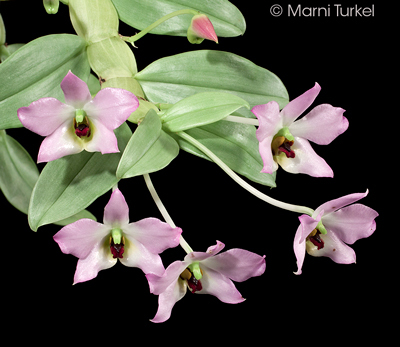 It is found at elevations of 2600 to 3300 feet. 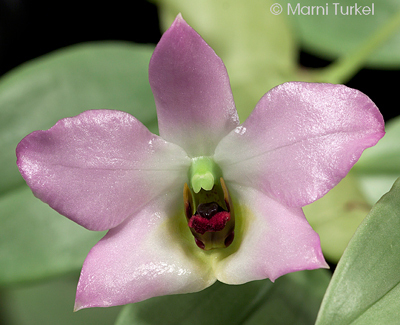 The flowers are 2" across, waxy and of heavy substance and very long-lasting. The plant stays compact and may reach a height of 10". Culture: The elevation suggests that this plant grows warm, but I grow this plant in intermediate or cool-intermediate conditions. It grows best for me potted, usually in a fine bark mix, but I have also grown it mounted. I give it year round water and dilute fertilizer and let it approach dryness between waterings. Pollen Parent: I don't seem to have any images of this clone but it is similar to the capsule parent.